If you need an alternative heating and cooling system for a garage or new room addition G&H can install ductless cooling and heating systems that will meet your needs. These small indoor devices are installed high on the wall and offer great flexibility by delivering air directly to different zones. Mini-splits are comprised of a small outdoor unit and one or more indoor units requiring only mounting capabilities and electrical access. Ductless systems operate on less power - they are smaller than traditional forced-air systems, and because the temperature-controlled air is delivered directly into a room, there is no loss in efficiency. Mini-split systems also allow homeowners to create "zones" in their home, which means they no longer have to cool or heat rooms that aren't occupied. Often times, the indoor air quality can actually be lower than the quality of outdoor air. With traditional HVAC systems, air ducts must be professionally cleaned on a regular basis, and even after cleaning, dust and allergens are left behind. Ductless systems, on the other hand, offer multi-stage filtration that can drastically reduce dust, bacteria, pollen, allergens and other particulates in the air. Ductless systems are less invasive to install, and depending upon the number of indoor and outdoor units required, can be up and running quickly. Mini-split systems run on small pipes that require a mere three-inch hole. That means homeowners don't have to worry about rebuilding walls or ceilings around ductwork and there is no loss of square footage. 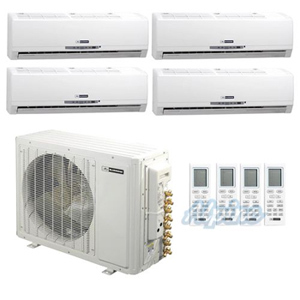 The small size of a ductless cooling system and its zoning capabilities allows for greater energy efficiency. Ductless cooling and heating systems follow ENERGY STAR guidelines. Improved efficiency saves money, of course, but it also helps reduce your total carbon output.